Wakesurfing is a less known water sport but an incredibly rewarding one. Wakeboarding combines with surfboarding to give you the ultimate summer experience. Similar to wakeboarding this sport is done behind your boat using the wake provided from your boat. Unlike wakeboarding though there is no rope to harness you to the boat and so you are free to move through the waters on your own. As different boats create different wakes it is important to get the best wakesurf board to fully appreciate this summer activity. Here we review the top ten wakesurf boards on today’s market to help make your shopping trip a breeze. 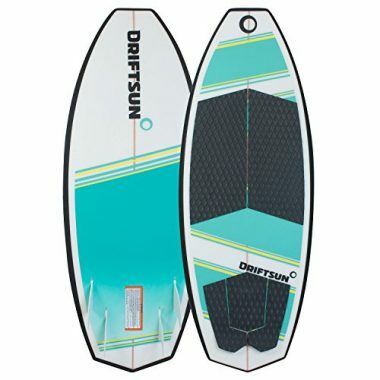 Driftsun makes a fantastic surf style board with this one being perfectly suited for beginner and intermediate riders. This is a board that riders can grow into with a completely customizable setup. Beginners will love how comfortable the board is and how easy it is to learn off. Riders with more experience will enjoy the high speeds and expert precision and maneuverability this board offers. Great for practicing new stunts this board gives you the confidence to take your surf further than ever before. The Throwdown boasts a custom shape that looks great. A natural wood stringer with a hand finished epox and layered fiberglass surface looks great in the water. An EVA traction pad with kicktail is incredibly comfortable and built for extended rides. 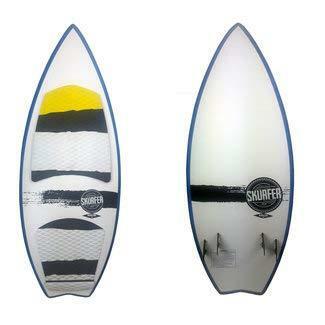 Featuring a quad fin setup which is great for those looking for added customizations. Effortlessly remove fins to find the ride that is perfect for you. The shape of this board is built for three things: responsiveness, stability and speed. The low rail and the rolled edges keep your board stable while the dual concave design square nose and rocker line gives you a fast and responsive ride. This is one of the best beginner wakesurf board on today’s market. This board allows you to get up and stay up with ease. 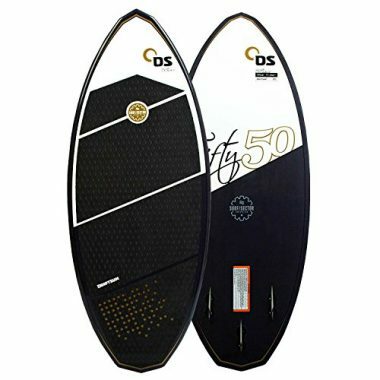 A great board to build your confidence on, the Driftsun Fifty-50 Wakesurf Board will build your confidence giving you a stable ride with minimal effort. 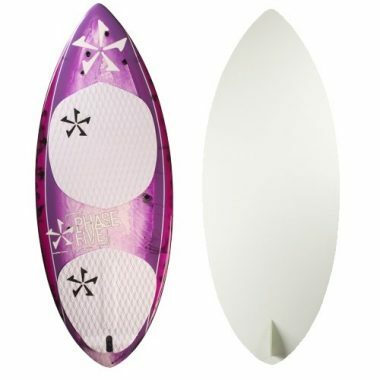 The surf style design of this board closely mimics that of a regular surfboard thus creating an easier to learn canvas. This style also lends itself to higher speeds allowing riders to work less hard in order to achieve their desired speeds. This board comes with the most popular tri fin style setup. This allows riders complete control in diversity of deciding whether they use one, two or three fins. This control will allow beginner riders to build their skill and comfort levels. The compression molded design combined with the EVA pad and kicktail gives this board precision while being easy to maneuver. 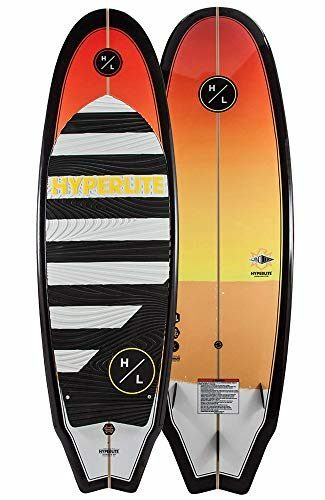 This board comes as a package with a surf rope which allows you to buy an all in one that will get you out on the water enjoying your day faster. 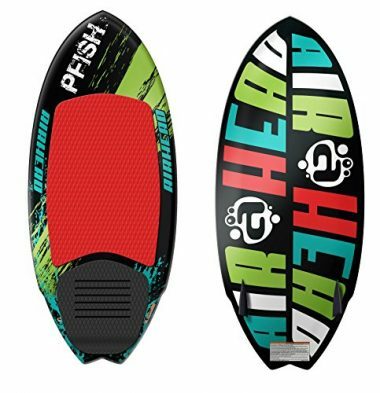 Airhead delivers another exceptional board with their Fish board. Being a skim style board this board is more geared towards riders who have more experience in the sport. 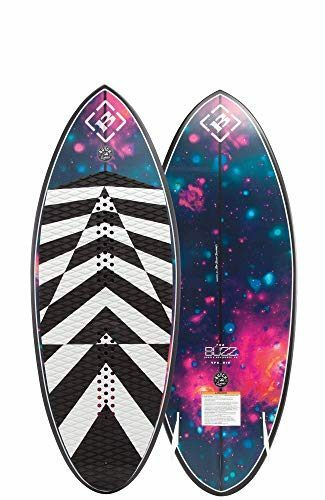 While the board features a full shape with a fishtail setup which is forgiving to beginners allowing someone with less skill to start on the board, it isn’t built for those who have never done any watersports. The skim style though is generally built for expert riders looking to push the limits and try more stunts while on the water. Advanced riders love how stable this board is giving them the confidence to push the limits and practice some extreme stunts. This board features a maximum weight capacity of 175 lbs making it a bit limiting for some adult riders. This is to allow the board to effortlessly glide over the water and allow riders a more wild ride. Featuring a double fin setup this board has everything riders need to get out and catch some air on the water. This board has a thickly grooved EVA deck that allows your feet to grip the board and hold onto the traction. 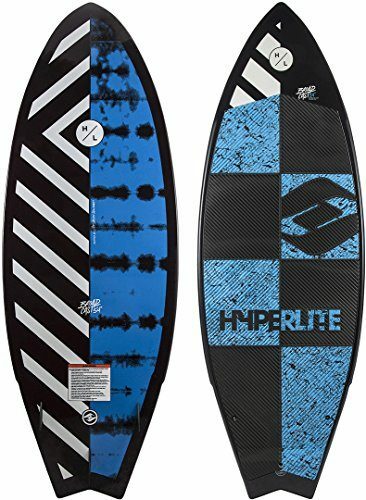 If you want to tear through the water at top speeds the Hyperlite Broadcast Ride Blank is the board for you. This surf style board allows you to take on the waves just as you would with a regular surfboard. Being compression molded allows there to be a large surface area despite the boards shorter size. The tri fin system gives you versatility to enjoy a ride with one, two or three fins. The board features double edge rails that allow you to hug the waves and grip effortlessly making it a great option for performing stunts. This board is easy to ride and fully customizable making it a great option for all riders from beginners to advanced. Ronix designed this board with one thing in mind: fun. Ideal for beginners, the wider nose design provides added stability ensuring you get up with ease. More experienced riders will enjoy the boards faster rockerline allowing you to soar through the water. Sitting high out of the water makes this board ideal for almost any wake. This board features the comfortable and incredibly diverse tri fin setup that allows you to completely customize your ride to the day’s conditions. The Koal Classic Fish is available in three different lengths which allows almost any rider enjoy the board. The boards EVA core has concave pads that provide arch support for your ride allowing you to stay up longer. This gives you ultimate comfort to enjoy your day. The extra tall tail kick of this board allows you to soar through the water. Ronix is a top manufacturer of Wakesurf boards. The Modelo Fish Skim has been designed to be as thin as possible. Ronix does this by utilizing a stiff outer shell which gives the rider the most control. You won’t have to wait for your board to catch up to your body giving you even more time on the wake. A three fin setup allows you to customize the setup to your preference. Ronix’s attention to detail and use of high quality materials are showcased by their exceptional one year warranty. Since this board has been so finely tuned it is recommended for intermediate to expert riders. This board is a great option for any rider. 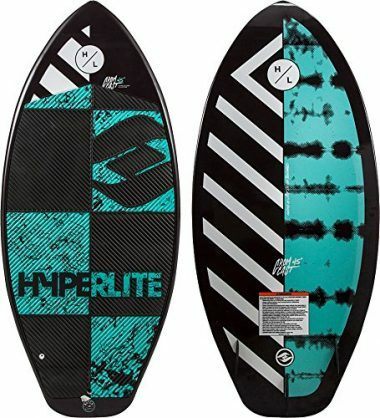 Offering something for everyone, the Hyperlite Gromcast is a top performer. New riders will feel comforted with the boards one year manufacturer’s warranty. This progressive style board has a dual concave base the combines perfectly with the rocker line to give you a board that is incredibly fast and very responsive. The deck of this board features two EVA foam pad that provides comfort and traction for riders. This also allows riders to distribute their weight anywhere on the board as to have complete control. Expert wakesurfers love that this board gives them the speed and space to perform rotational tricks. Riders that are still learning the sport will have luck with how easy the board is to ride. Maintaining momentum on this board requires minimal effort keeping new riders in the waves sweet spot. Operating with a tri fin system, the fins on this board are removable. This is especially appealing for riders with a bit more skill as they can customize the board to have one, two or three fins. This makes the board suitable for almost every wave type. Over the years the Race has been one of the top wake surfboards on the market. This years has seen it have a smaller shape with a more compact design. If you love riding the nose this is the board for you. The lines and shape give you full reign of your board. Move around where you like without nose diving. A two fin setup allows control without overpowering you. The interior foam has carbon running the length of the board which has been coated with an aluminum and glass weave. This gives the board speed and agility while maintaining durability and enough traction even in wet conditions. Phase 5 has created an excellent wakesurf board that will allow your skills to grow and mature. This is a great beginner wakeboard as it is built for a laid back, enjoyable ride. The Hyperlite Landlock features a layered glass construction that looks great on the water. The platform of this board has lots of surface area that combine with the rolled edges to provide the board with maximum stability. A tri fin setup means this board is customizable to suit the needs of the rider. You no longer need a different board for different sized wakes this board is a great all in one that allows you to adjust it to your daily needs. The picture of durability this board is built to last. A large EVA foam pad sits atop this board allowing you to disperse your weight as you wish while giving you the traction and comfort you are looking for. The deal just keeps getting sweeter as Hyperlite included a one year manufacturer’s warranty with this board. The three stage rocker is bound to impress even the most advanced of wakesurfers. This gives the board a ton of stability allowing riders to gain confidence in the sport. This board isn’t designed from layered foam but rather one perfectly sculpted hand made foam slab. This makes the board incredibly durable helping to last you year after year. A tri fin system gives the rider complete control over customizing this board to have one two or three fins. This is a hybrid wakesurf board making it an appealing option to almost every rider. Ease of use and the speed functions in the surf design appeal to beginner riders as well as those with some experience. Experts will love the skim style as it allows you to push the limits and take this sport to the next level. Wakesurfing is a fun sport that all age groups enjoy. There are quite a few aspects of a wakesurf board you should understand when determining the right one for you. Wakesurf boards have many features that can make them better in certain situations than others. The tail of your wakesurf board will affect not only how it rides but also your balance when on the water. There are a few different styles to choose from (up to 8 if you include all of them). As the name suggests, this tail type is the narrowest of the bunch making it an ideal choice for riders heading into bigger waves. The small tail dips lower into the water giving you an ideal low center of gravity. This helps you to get a lot of grip in the water making it a popular choice. The low dip in the water does make it hard to take on smaller waves though. The square tail is built for speed. Sitting high up out of the water you can expect to have a harder time getting your footing and keeping traction. The pick up on this tail design is excellent allowing you to hit top speeds fast. The swallow is a happy combination of the square and pin tails making it a popular choice amongst riders. Ideal for mild to moderate waves this design is easy to control while still being capable of hitting thrilling speeds. Squash tails are the most popular kind of tail design on the market today. These are the most commonly seen as they are able to adapt to a variety of wave conditions. From smaller waves to those with some power, the squash tail design can handle it all. Providing excellent performance and reaching top speeds this wakesurf board is still an easy ride. For those that frequent a variety of different waters, the round tail design is an optimal choice. Ideal for many different wave conditions this wakesurf board is much like the pin tail but features a more spacious surface area. This wider back is ideal for showing off with simple tricks and fun turns. If you have tried and enjoyed the squash tail board you will likely also enjoy this design. This popular choice is a mix between the pin and the squash tail offering some killer speed in an easy to maneuver design. This makes it an ideal wakesurf board for those looking to perform some tricks as well as looking for an easier ride. An ideal choice for riders of all skill level this tail design is commonly found on many wakesurf boards. While this isn’t a commonly seen tail design there are some boards that still feature this look. The half moon design features minimal board area following the fins. This allows the rider to be able to turn with ease making it a board suitable for those doing tricks in the water. This wakesurf board is easy to maneuver no matter the wave size. This bat tail is not commonly used in wakesurf board designs. This board type has an incredibly wide tail that is very stable on the water. The sharp corners of this design cut through the water making this board easy to maneuver. This is arguably the most important part of your wakesurf board as it controls the amount of water flowing over your board. Beginner riders often opt for a board with a thicker rail as it helps provide added grip. This extra stability comes at a price as your board will be slowed down by water not being able to freely flow over your board. Those with more experience tend to opt for a board with a thinner rail. This allows riders to hit maximum speeds as the water flows over the board with less resistance. When you are looking for your next wakesurf board you will come across 3 different types of rail system on boards. Great for beginners, a full rail design allows you to stand stable on your board giving you a smooth ride. As this board excels at building your confidence on the board, it does fall short in performance being a difficult board to make sharp turns with. This is a great design for those with some confidence on their board who are looking to do tricks and stunts. Turning easily on a dime, this rail type has less stability and is a harder ride. This is the best option for most wakesurfers as it is the perfect blend of stability and performance. An excellent choice for beginner and intermediate riders, this rail type allows you to keep your balance on the board and ride in a straight line. Additionally, it is able to turn relatively sharply making it ideal for practicing some stunts. You may notice this word from many different other types of watersports that you have tried. The rocker of your board refers to the amount of curve your board has when put on a flat surface. The level of curvature your board has plays a direct role in its performance. If your board has a heavy rocker it will sit low in the water making it more stable and easier to maneuver. Alternatively, if your board doesn’t have a lot of rocker it will sit higher on the water allowing it to hit maximum speeds. Just like surfboards, wakesurf boards have different fin configuration. They can come with 1 fin up to as many as 5. Each configuration has a different use and will help you achieve a different goal. A single fin design will essentially act as a boat’s rudder. This board will guide you and keep it on a straight path. If you didn’t have a fin your board would slide around on the surface of the water. A drawback is that you will not be able to increase your speed as if you were on a multi fin board. Many people prefer a two fin board. These give you more control in the water. Just keep in mind that these rigs are meant for smaller waves. Three fin wakesurf boards are the ones most people will be familiar with. They are the most versatile boards and can be used in nearly every wave situation. You will be able to significantly increase your velocity with not much effort due to the additional wing. If you are looking for a wakeesurf board with the most speed possible a four fin setup will be your ideal. This type of wakesurf board will be able to ride even the biggest waves you can throw at it. We find this to be a close second to the three fin board for overall rideability. If you up the fin count to five your board will see an increase in stability but a decrease in speed. This is due to the added drag and resistance through the water. Wakesurf boards will usually fit into three different categories: skimboards, surfboards and hybrid boards. Skimboards will be for people who have some experience in the sport. They are predominately used for competitions and tricks. Their sleek bottom makes them one of the more difficult boards to ride no matter what watersport you’re used to. If you are just getting your feet wet in the sport you will want to start with a surf wakeboard. You will be able to control these boards with little effort with enough balance to advance your skills. People who are new to the sport but are looking for a challenge should get a hybrid board. They strike a good balance between the difficult skimboard and an easy surf wakeboard. You will be able to balance and control it while even doing some jumps and tricks. Unlike other sports wakesurf companies vary in quality. Some companies have been around for years while newer kids on the block are trying to make a name for themself. One of the best indications about the quality of their boards is how long they’ve been in business for. For example, if you are choosing between a company that’s been in business for over a decade versus one that’s new to the game, we strongly suggest the veteran company. They will have the experience and knowledge needed to make great boards. After all, there’s a reason they’ve been in business so long: people keep coming back. What Is The Best Wakesurf Board For You? While you may think that choosing a wakesurf board is easy, there are actually a lot of different shapes and styles on the market that you should be aware of before you buy. This will allow you to choose the best one for your needs and thus ensure you don’t have to spend the added money on a new board later. At the top of any wakesurf board guide you will see that there are three distinct types of boards on the market. The expert skim board, the go-to surf style board and the combination hybrid style board. This board style is built for the expert rider that enjoys doing tricks in the water. A perfect option for doing spins and catching air, this board style makes even expert riders work giving them a more challenging and fun ride. This is a great style for both beginners and advanced riders alike. This board style is similar to that of a regular surf board and carries a much similar appeal. You will feel like you are out in the ocean catching waves when riding this. Beginner riders will enjoy that this is the easiest board style to learn on. Allowing you to effortlessly ride the surf at top speeds this board gives expert riders the freedom to maneuver the water they are looking for. This blends the aforementioned board styles in order to offer you a board that meets intermediate to expert riders needs perfectly. A hybrid board blends the high speeds of a surfboard and offers easy maneuverability while still allowing you to push the limits of your latest stunt. Q: How Do I Clean My Wakesurf Board? A: You will want to clean your wakesurf board after every time you have the board in the water. You do not need to do a lot to clean your wakesurf board, and you will be mainly rinsing your board with fresh warm water. This will remove any debris from your board, such as sand and will dissolve any salt which has accumulated in any seams or other places. Once you have rinsed off your board, you should allow it to dry before you put it into storage. If your board is dirty, then you can use some warm soapy water and a non-abrasive cloth to wash your board down. As you are rinsing or washing your board, you should be checking it for any damage. If you can catch any damaged areas early, then you can repair it before it becomes a bigger problem. A small ding or scratch can be patched instantly with some waterproof tape. Larger gouges and dents will need to be filled with an epoxy resin. Make sure to sand and clean the area before you add tape of epoxy. Q: Where Do I Store My Wakesurf Board? A: To ensure that your wakesurf board is kept free from damage when your board is in transit or storage, you should invest in a high-quality board bag. If you are traveling to your surfing destination, then a good bag will stop your board from becoming damaged as it moves around a car. You can also invest in a rack for your car to store it on as you are traveling. A rack can be a useful addition to your home for storing your rack. If you have your board stored laying flat or even in its side, then there is less chance of the board becoming damaged. If you do not have a rack, then do not store your board on its end or you risk warping and bending. You should also never store stuff on your rack, or you risk damaging your board. It is our recommendation that you store your board in a cool dry place, and out of direct sunlight. The UV rays can damage your board. If you do have a board bag, then we recommend always having it in the bag when it is in storage. Q: What Is The Best Material For A Wakesurf Board? A: Most wakesurf boards are made of foam which is covered with epoxy fiberglass. This makes the boar light and fast, but this type of board can also be fragile. Compression molding is often used in newer boards to give a more durable finish. These boards are still affordable but are more durable than the foam and epoxy fiberglass combination. Compression molded boards are usually slower, but this makes them great for beginners who want to get used to maneuvering a board through the water before they build up speed. Hybrid boards offer a softer foam on the top and a slick base. This wakesurf boards are comfortable and offer a lot of speed. There is a lot of information to consider when looking at the best wakesurf boards. Boards will vary greatly from beginner models to competition and pro boards. There are many categories and variations you should be aware of before making a purchase. By using the information in this guide you will be able to confidently understand every feature available. When reading through the wakesurf board reviews on our list you will see that they are all made using top quality materials. This is the biggest distinguishing factor between the quality of the boards. Having the best wakesurf board will ensure that you get the most out of this sport and allow your board to last through the years. This wakesurf board buyers guide was designed to help you find the perfect board for this summer sport. New to Wakesurf Boards or have a Wakesurf Board on our list? Let us know how you like it in the comment section below.